NEW YORK, Aug. 8, 2018 /PRNewswire/ -- Shutterstock, Inc. (NYSE: SSTK), a leading global technology company offering high-quality assets, tools and services through its creative platform, today announced it has partnered with Magic Leap to provide images and video to enable developers to bring their imagination to life through the Magic Leap One, Creator Edition. Shutterstock is providing its versatile visual assets through Magic Leap's spatial computing platform to help inspire and support this new generation of developers bringing digital experiences to the physical world. "It is really exciting to be working with a company as innovative and forward thinking as Magic Leap," said Jon Oringer, Founder and CEO of Shutterstock. "To know that assets from Shutterstock will help provide some of the digital building blocks for developers to create new environments and entirely new worlds is the kind of thing Shutterstock is built for. Opening up our contributors' work to be used in a completely new way is thrilling. As a technology company first, Shutterstock is well placed to help feed the imaginations of these creative pioneers. I can't wait to see what they build." "Shutterstock has a stellar reputation as being the leading global provider of high-quality licensed images, videos, and music, and their content has inspired countless creators across the world," said Magic Leap Chief Business Officer Rachna Bhasin. 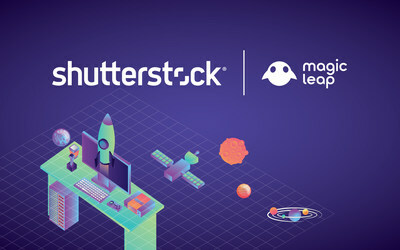 "As Magic Leap works to transform the future of spatial computing, we are thrilled to have Shutterstock as a partner to help evolve the way the physical and digital worlds intersect." With the Lumin-based Gallery and Screens Applications, developers will be able to use Shutterstock assets to decorate their world in fun and exciting ways. Developers can "place" images or videos in their environment, as well as view "placed" media at a later time. They can also design and build new Gallery experiences including digital picture frames to enhance their media collection. Within the Screens application, developers will be able to access a dedicated video channel where they can find beautiful footage including from Shutterstock. Learn more about the Shutterstock integration here and Magic Leap's Gallery and Screens application here. Shutterstock, Inc. (NYSE: SSTK), directly and through its group subsidiaries, is a leading global provider of high-quality licensed photographs, vectors, illustrations, videos and music to businesses, marketing agencies and media organizations around the world. Working with its growing community of over 450,000 contributors, Shutterstock adds hundreds of thousands of images each week, and currently has more than 200 million images and more than 10 million video clips available. © 2003-2013 Shutterstock, Inc. All rights reserved.